With Easter just around the corner we’ve put some of the Easter Crafts we’ve been doing into one place. Fill a container with shaving foam, then add drops of food dye (I used Wilton dyes) around the foam, using a toothpick or knife swirl the food dye through the foam. Place an egg in the foam and roll around to cover it in the colour swirled foam. Take out and place on a piece of baking paper. Leave for ten minutes, then rinse off and leave to dry. When dry they will probably need another wash to get off the residue of the foam. We then made a colourful nest for our eggs out of a paper plate, some glue and shredded paper. 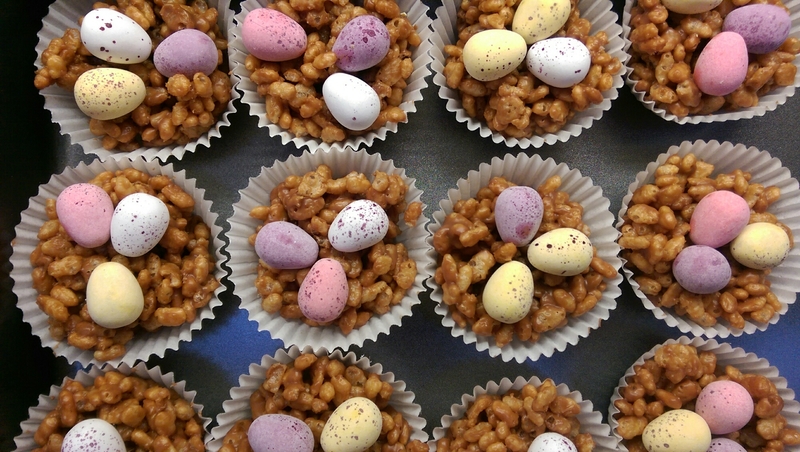 After you’ve been busy making your Easter crafts you could treat the children to some lovely Easter nests. It wouldn’t quite be Easter without a Chocolate Easter nest. Would it? We used Nigella’s Chocolate Krispy Cake recipe for the quantities. We found this made 30 nests, in your average sized cupcake cases. Why not send us photos of your Easter crafts via our facebook or twitter pages?